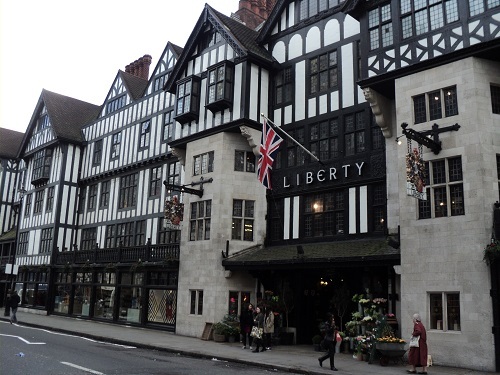 Liberty is one of the premier department stores in London known for its luxury goods which feature its floral and graphic prints. The stores founder Arthur Lasenby Liberty was born in Chesham, he worked for Farmer and Rogers in Regent Street for a decade before starting his own business in 1875. He started with a lease for part of a shop in Regent Street with three staff members. The shop sold ornaments and fabrics from Japan and China and was so successful in its first two years that he acquired lease for the whole shop and over time began to acquire neighbouring properties. At the end of the 19th century the store became one of the most fashionable in London, its exotic fabrics and “Eastern” furnishings and clothes began to appeal to a large buying public. It also became known for supporting the many designers who followed Arts & Crafts and Art Nouveau styles. 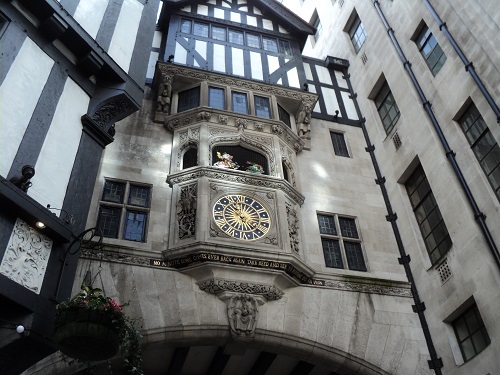 Considering its association with these styles it was unusual that the store was given a mock Tudor make over in 1920. Its unique interior of wooden balconies around central points produces a rather strange shopping experience. Equally strange is that some of the timbers on the exterior are taken from two old sailing ships, the HMS Impregnable (formerly HMS Howe) and HMS Hindustan. Liberty have always balanced contemporary and traditional designs and has worked closely with many leading designers throughout the stores history. By londonvisitors2014 in London Department Stores, Shops of London on February 26, 2014 .